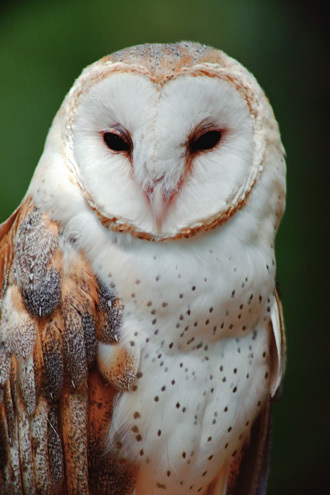 In this installment in our continuing series on the owls of New England, ONE looks at Barn Owls which are found in the southern regions of New England. These pale birds are closely associated with man through their traditional use of barn lofts and church steeples as nesting sites. 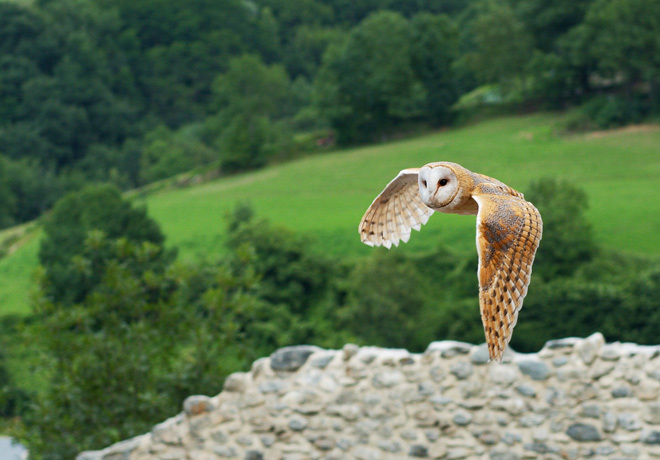 Although widely known beforehand, it wasn’t until 1769 that the Barn Owl was first officially described by Giovanni Scopoli, an Italian naturalist. Their most distinctive feature is their white heart-shaped face which has a brownish edge, brown marks at the front of the eyes, black irises and its beak is off-white. Unlike most owls it has no ‘‘horns’’ (actually feather tufts). The owl’s visage is often likened to a ghost and they are commonly referred to as Ghost Owls. Males and females are similar in size (around 14 inches in length, with a wingspan of 42 - 43 inches) and color with the females slightly larger and more densely spotted. They are generally nocturnal but they sometimes emerge at dusk and can still be active at dawn, occasionally being seen in flight during full daylight. 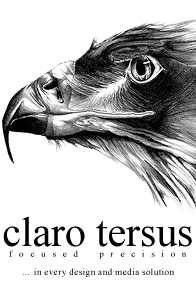 They fly soundlessly, with wing beats interrupted by gliding. They hunt voles (field mice) and other small rodents in open spaces. Unlike most owls the Barn Owl does not make hooting-type calls but instead makes a variety of noises including hisses and chirping sounds along with some higher pitched ‘screams’. A pair of Barn Owls calling to each other can be heard here. Barn Owls may breed up to twice a year and will do so irrespective of season; breeding instead being dependent upon a good food supply. During courting, males may circle near the nest tree, giving short screeches and chattering calls. The majority of Barn Owls nest in tree hollows up to 20 meters high. They will also nest in old buildings, caves, well shafts and manmade boxes. Three to six eggs are laid (occasionally up to twelve) at two day intervals and are incubated for thirty to thirty-four days. Owlets are covered in white down and brooded for about two weeks, and are fledged in fifty to fifty-five days. They remain in the vicinity of the nest for a week or so to learn hunting skills and then rapidly disperse. Young Barn Owls are able to breed at about ten months. The average life expectancy of a Barn Owl in the wild is just one to two years. In captivity the owls live much longer and teenage Barn Owls are not uncommon. 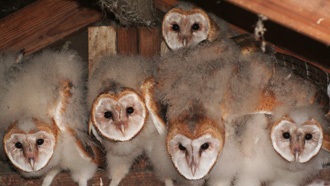 Barn Owls historically existed in good numbers across southern New England but a declining population has been attributed to the loss of grassland areas to development, loss of barns and other buildings that provide preferred nesting locations, the trend toward ‘‘cleaner’’ agriculture methods that eliminate weeds and brush and the use of rodent killing chemicals on crops. But there is a comeback in the making. A family of Barn Owls can consume 3,000 rodents in one breeding season, with adults foraging up to a mile away from the nest. 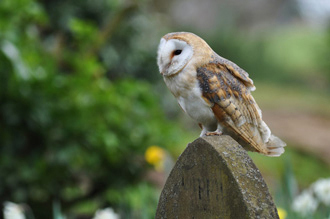 This is leading conservationists to encourage farmers and other landowners to lure Barn Owls onto their land, to deal with their rodent problems in a more environmentally conscious way. An innovative nest box for Barn Owls has been developed that is made of molded plastic, is lightweight, easy to install, and features a landing ledge, an entrance hole, a research window, and a removable front. It provides farmers with a long-lasting, affordable accessory to their pest management programs. With luck the Barn Owl will be a prolific sight in New England for a long time to come. In the next article in this series, ONE will look at the smallest New England Owl, the Northern Saw-whet Owl.